I was born in Denver, where my engineer grandfather demobilized after World War II. My mother grew up on Quebec Street, east of downtown Denver. My parents met at Utah State University, then set up house in Denver after graduation. 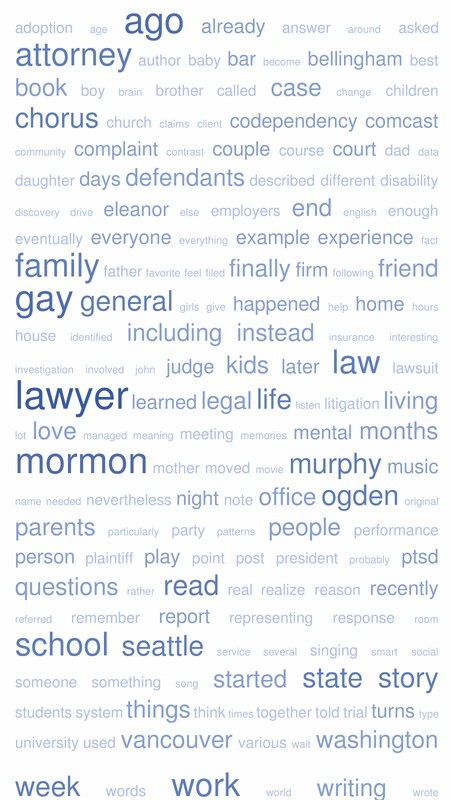 After we moved to Vancouver when I was a toddler, Denver and Utah became mythical family homelands. Every couple of years, my parents stuffed four boys into the Datsun and trekked southwest to visit each set of grandparents and cousins. Brigham Young sent the Mormon pioneers to settle assorted-sized valleys in the tops of the Rocky Mountains. My father grew up milking cows in small Cache Valley. After being exiled from Vancouver, I went to high school and then college in medium-sized Bear River and Utah Valleys. Brother Brigham stayed in large Salt Lake Valley, except when visiting his vineyards in Utah’s sunny Dixie. Brigham left his mark on Utah valleys of all sizes, including the personal brand of his boring street grid. 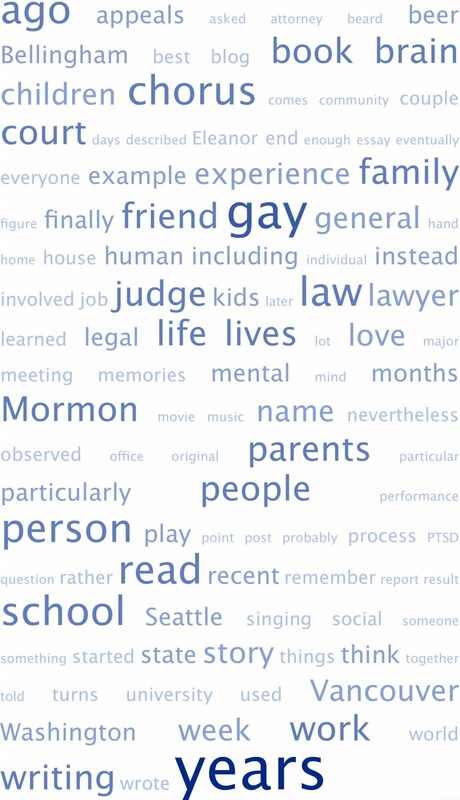 No confusing namby-pamby floral cul-de-sac names like Amaryllis and Zinnia for Brother Brigham. No, he insisted on big wide streets at strict right angles, with numerical names generating practical addresses like 250 West 400 North. (Like the men of Clan Leishman, Brigham wanted to reduce his risk of asking for directions.) But was Brother Brigham enough of a Prophet to foresee his grid filling valleys large and small, and to cringe at mind-numbing modern addresses like 42500 West 11700 South? In contrast with Mormondom’s protected valleys, Denver is next to the Rocky Mountains. Rocky Mountain-adjacent. That's a realtor’s way of saying Denver is on the plains. Half of every building has a spectacular view of the Front Range, while the other half of each building has a boring view of Kansas. Denver is laid out on a street grid so flat, square, and sprawling it would warm Brigham’s heart. Not the street names, however. Beyond a few numbered avenues, municipal bureaucrats managed to come up with enough floral terms and dead white surnames to reach the horizon. I remember my mom explaining how Denver’s street names run alphabetically as you go east. By the time we moved to Canada, my grandparents had moved a few blocks west of Quebec and a couple of high-falutin’ miles south to a classic ranch-style house on Niagara Street. Denver had so many streets they used two for each letter of the alphabet: Niagara and Newport, Quebec and Quince, Xanthia and Xenia. The alphabet starts over again with Akron and Alton, then with Abilene and Atchison, then Andes and Argonne, as you drive due east down Colfax Avenue across the prairie forever. Now I live in Bellingham, which is a cluster of forested hills squeezed between the water and the mountains. The city has four separate street grids, because it began as multiple separate coastal settlements. Old Fairhaven still features Victorian buildings on numbered streets, while the former town of Whatcom left behind a quaint neighborhood of lettered streets from A to J. 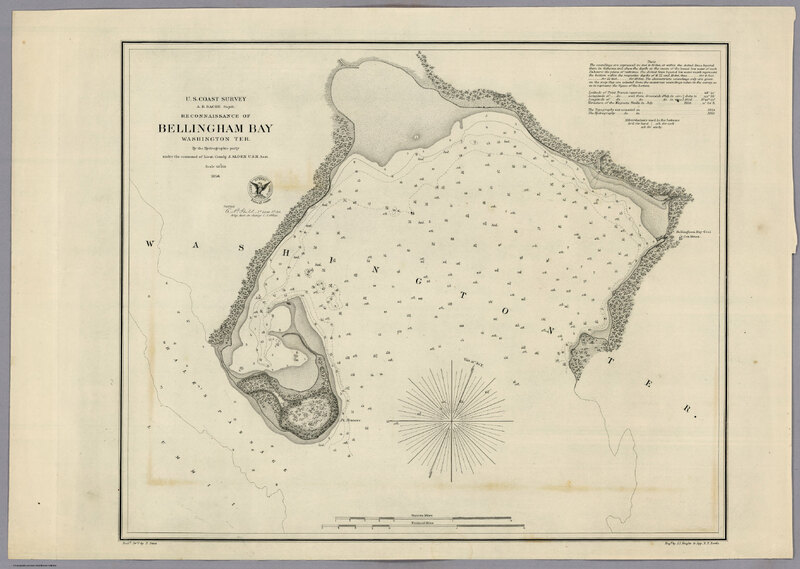 At an impasse over which town name would prevail, the citizens named the combined city Bellingham after the adjoining bay. 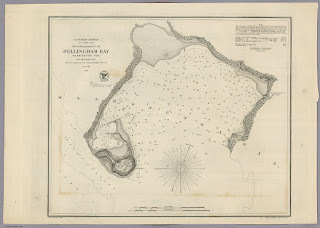 Captain George Vancouver had obsequiously named the harbor after Sir William Bellingham, his supply guy at the Royal Navy. Like Denver’s civic fathers, the founders of Bellingham’s pre-consolidation settlements tried to simplify things with several alphabetic series of street names. But between the water, hills, and forest, our alphabet sequences tend to peter out long before you reach interesting letters like R. For example, we live in what was formerly the town of Sehome, at the crossroad where a penultimate N and a vestigial M meet before each road disappears into the forest forever. Bellingham’s closest equivalent to Denver’s Colfax Avenue is Alabama Street. Alabama gives drivers a rare straight shot on a flat plain. Heading due east, you will make it all the way through the alphabet to Toledo, Undine, Valencia, Woburn, Xenia, and Yew. Then as you start climbing Alabama Hill, the grid mysteriously switches to Great Lakes and a few stray tree names, before cresting the hill and running into a lake. My parents moved to a house on the top of Alabama Hill the year after I graduated from high school in Utah. So I’ve memorized Bellingham’s one extended sequence of alphabetic street names. For thirty years, I thought “Xenia” was just another flower name. It turns out it’s actually the Greek term for hospitality: the sacred relationship between host and guest. 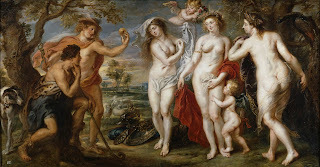 The concept of Xenia evolved from “theoxenia.” Greek myths are filled with the story of mortals who extend hospitality to strangers (xenos) who turn out to be gods in disguise (theos). Every guest should therefore be treated as a potential deity. This concept is echoed in the New Testament, when Jesus tells his followers they will receive eternal life if they take in strangers or feed the hungry, for “inasmuch as ye have done it unto the least of these my brethren, ye have done it unto me.” Matthew 25:40. These tales focus on the potential for rewards from a grateful god after she reveals her secret identity. But as with our Northwest Coast tribes’ potlatch, the real goal of Xenia is mutual grace and generosity. Xenia obligations go both ways. Hosts should welcome their guest with food, drink, shelter, and gifts. Hosts should also let their guests finish eating dinner before grilling them about their business. Unlike Mr. and Mrs. Macbeth, hosts should not stab their guest and seize his throne. Conversely, guests should be gracious, and avoid becoming a burden. If possible, they should bring gifts for their hosts. Like wine or edibles. 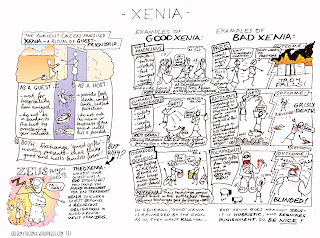 Xenia, like similar concepts in other pre-modern cultures, has evolutionary benefits. We are social animals, born into a particular tribe. Our core identity emphasizes the life or death differences between kin and stranger. Nevertheless, as we've seen at the cantinas in both Star Wars and the CW's Supergirl, sometimes it's best if humans know peaceful ways to interact with aliens. In a pre-mechanical era, even a short journey required travelers to spend multiple nights away from home without the benefit of hotels or Airbnb. Shared customs of hospitality and mutual obligation allowed strangers to travel safely. This diversified the knowledge and gene pools, but didn't undermine the tribe’s paramount role. 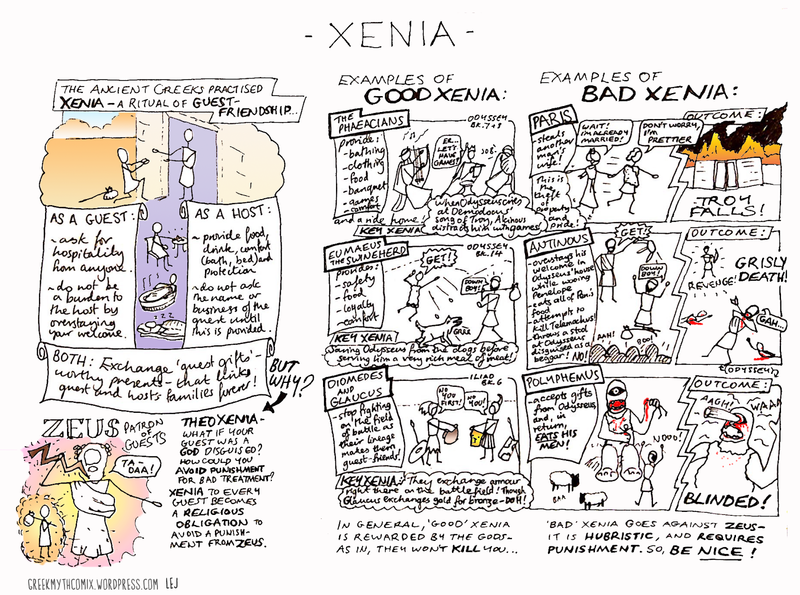 Thus numerous Greek myths teach the importance of Xenia, even without the flashy deus ex machina of gods in disguise. Paris' misjudgments about hospitality are at the center of Homer’s Iliad. Paris was the son of Priam, king of Troy. The prince was spirited away at birth and adopted by humble shepherds after an oracle prophesized Paris would bring doom to Troy. Ask Oedipus: no one in ancient Greece escapes his horoscope. Meanwhile, Zeus invited all the gods and demi-gods to Mount Olympus for a lavish wedding banquet. Except for Eris, the boorish goddess of discord. In retaliation, Eris tossed a golden apple into the wedding party. It was inscribed with the word Kallisti: “for the fairest.” Sorta like what happened when Sleeping Beauty’s parents left Maleficent off the invitation list for the princess' christening. Joseph Campbell was right, in the end every culture’s myths are the same. Each of the assembled goddesses insisted the golden apple referred to her. Hera, Athena, and Aphrodite – Zeus’ wife and daughters – made the final cut. After sensibly recusing himself, Zeus appointed Paris as judge. While hanging with the shepherds on Mount Ida, the now openly-Trojan Paris happened to have gained a reputation for honestly judging livestock. It’s like the plot of a telenovela. All three goddesses attempted personalized bribes. Hera offered Paris dominion over all the kingdoms of Europe and Asia. Athena proposed to make him the greatest warrior in history. And Aphrodite promised the love of Helen, the most beautiful woman in the world. The hormonal mortal youth chose love. To pick up his judicial booty, Paris traveled to Sparta. As Xenia requires, King Menelaus treated Paris with hospitality, hosting Paris in his palace and lavishing him with gifts. Paris then sailed home to Troy with Queen Helen, Menelaus’ wife. How rude. I prefer the versions of the story where Helen ran off with Paris after falling in love with him. And it’s an even better story if they both also love Menelaus, as in Le Morte d'Arthur or an operatic Wagnerian love triangle. A fleet assembled from all the kingdoms of Greece sailed to Troy to avenge this outrage. As Shakespeare’s contemporary Christopher Marlowe wrote, Helen’s was the “face that launched a thousand ships.” Her face next launched an epic ten-year siege where nothing but poetry happened. Finally, with the help of Athena, Hera, and a wooden horse, the Greek armies razed Troy. Paris’ ultimate misjudgment: two spurned goddesses joining forces with Team Greece will eventually beat a Xenia-less Team Troy relying on one flakey Goddess of Love.